A Lee Chip is the product of more than sixteen years’ work by Theodore R. Johnson. The entries are based on interviews, recordings and written sources from the past century. The dictionary marks the first comprehensive, historical record of the Saban lexicon. It features more than two thousand words, usages, meanings and folk expressions that can or have been heard on the island. ​The dictionary is rich in the terminology of traditional Saban culture, illuminating cultural practices connected with fishing, farming, cooking, and many other areas. Local names for flora and fauna forms a major component of the dictionary. In addition to a background of English language usage on the island, the book includes chapters on pronunciation and grammar. Illustrations throughout the book include original watercolors byStacey Simmons, as well as photographs from the past and present. 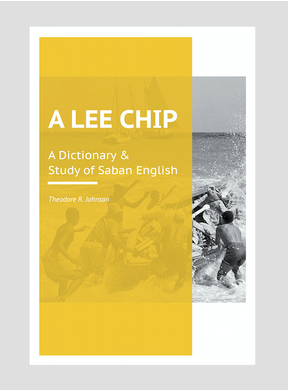 More than a dictionary, A Lee Chip is an index to the history and traditional culture of Saba. It will be a definitive resource for both the language and culture of Saba for years to come.